The first great church on the site was built by Constantius II, the son of Constantine the Great and dedicated in 360. It was burned down during the Nika riots of 532. The building was rebuilt in its present form between 532 and 537 under the personal supervision of emperor Justinian the Great. It is one of the greatest surviving examples of Byzantine architecture. Of great artistic value was its decorated interior with mosaics and marble pillars and coverings. The temple itself was so richly and artistically decorated that Justinian is believed to have said Νενίκηκά σε Σολομών: "Solomon, I have surpassed you!" The architects of the church were Isidore of Miletus and Anthemius of Tralles, professors of geometry at the University of Constantinople. Justinian's basilica was at once the culminating architectural achievement of late antiquity and the first masterpiece of Byzantine architecture. Its influence, both architecturally and liturgically, was widespread and enduring in the Orthodox, Roman Catholic, and Muslim worlds alike. Hagia Sophia is covered by a central dome with a diameter of 31 meters (102 feet), slightly smaller than the Pantheon's. The dome seems rendered weightless by the unbroken arcade of arched windows under it, which help flood the colorful interior with light. The dome is carried on pendentives: four concave triangular sections of masonry which solve the problem of setting the circular base of a dome on a rectangular base. In Hagia Sophia the weight of the dome passes through the pendentives to four massive piers at the corners. Between them the dome seems to float upon four great arches. At the western (entrance) and eastern (liturgical) ends, the arched openings are extended by half domes carried on smaller semidomed exedras. Thus a hierarchy of dome-headed elements build up to create a vast oblong interior crowned by the main dome, a sequence unexampled in antiquity. The structure has been severely damaged several times by earthquakes. The dome collapsed after an earthquake in 558; its replacement fell in 563. There were additional partial collapses in 989 and 1346. All interior surfaces are sheathed with polychrome marbles, green and white with purple porphyry and gold mosaics, encrusted upon the brick. On the exterior, simple stuccoed walls reveal the clarity of massed vaults and domes. For over 900 years the Hagia Sophia was the seat of the Patriarch of Constantinople and a principal setting for imperial ceremonies. It was converted to a mosque at the Fall of Constantinople to the Ottoman Turks under Sultan Mehmet II in 1453. Since Islam considers the depiction of the human form to be blasphemous— that is, it is iconoclastic—Hagia Sophia's iconographic mosaics were covered with plaster. For almost 500 years the principal mosque of Istanbul, Ayasofya, served as model for many of the Ottoman mosques of Constantinople such as the Shehzade Mosque, the Suleiman Mosque, and the Rustem Pasha Mosque. 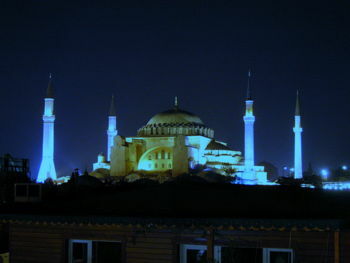 In 1934, under Turkish president Kemal Atatürk, Hagia Sofia was secularized and turned into the Ayasofya Museum. Nevertheless, the mosaics remained largely plastered over, and the building was allowed to decay. A 1993 UNESCO mission to Turkey noted falling plaster, dirty marble facings, broken windows, decorative paintings damaged by moisture, and ill-maintained lead roofing. Cleaning, roofing and restoration have since been undertaken. Although Turkey, and Istanbul in particular, are more secular than most Muslim countries, the status of Hagia Sophia remains a sensitive subject. The Islamic calligraphic displays suspended from the main dome remain in place. The mosaics are being gradually uncovered, including some visible from the ground floor. Athelstan Riley. Give Back Saint Sophia: A Report of the Speeches Delivered at the Opening Meeting of the Crusade for the Redemption of Saint Sophia, held at the Cannon Street Hotel, on January 23rd, 1919. London: Faith Press, 1919. Rev. J.A. Douglas. The Redemption of St. Sophia. London & Manchester, The Faith Press, 1919. This page was last edited on March 6, 2013, at 17:31.